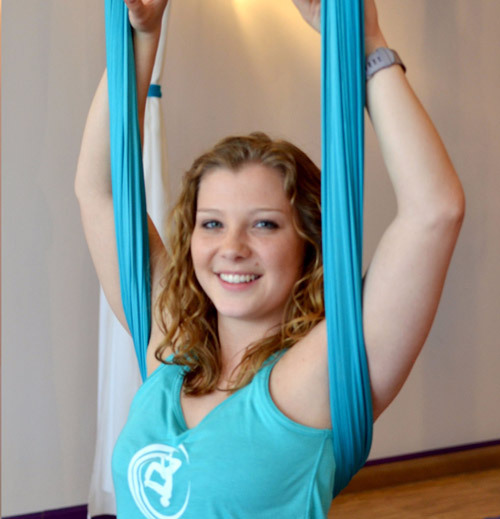 Aerial Teaching Team - Wilmington Newark DE Studio — Aerial Fun & Fitness - one hammock. many styles. Zina DiTonno, owner and Master Trainer credentials and experience. The certified Instructors bring their backgrounds including yoga and dance to aerial fitness. My passion is to be a leader in word and deed to create a community for wellness. Seeing people empower themselves brings joy to my heart. Aerial Fitness is a tool to do so. Did mention FUN? It creates changes in people; conquering fears, trying something new, and pushing beyond their comfort zone. Included are the great benefits of exercise and then some more unique benefits of aerial fitness; spinal decompression from supported safe inversion, stability training, core and upper body conditioning (this is especially great for women). There are 9 years old to 75 year olds that can do this and it is tailored to the de-conditioned persons or to the athlete. There are many ways to functional assist or challenge an individual. The other fitness certifications round out the many way of seeing and using the body to apply to aerial fitness. The past experience of serving in the military prepares me mentality to help and break thru barriers, and an M.S. in Computer Information Systems, keep my research and learning skills sharp to keep growing techniques and skills. Understanding and working thru our ruts and insanity (doing the same thing over and over and expecting different results) is another bump in the road we have to 'fly' over. Aerial Fitness challenges the body in a multi-dimensional movement way to help 'fly' over the bump. I personally train my instructors to make sure we are all on the same page. It's a new day. I am also available for personal training options. Military Training / Experience (1990's) • P.T. Officer (body fat standards and lifestyle changes), • Earned and Maintained Expert Fitness Badge (maintain 290 or above for fitness. ), • Earned Expert Field Medical Badge (EMT skills for combat, CPR, and intense physical training. ), • Combat Medic Trainer, • Offered slots on 10-mile Team and Physical Fitness School. Come check out Kelsey's personable and graceful teaching style. Her lines tell a story of poise and ease while instructing with all the details to create a wonderful aerial fitness experience. Certified in Level 1 and 2, and Lead Choreographer for Aerial Barre Fitness and our student showcases and Asst. Trainer and Choreographer for Aerial Bungee Fitness Level 1+. Kelsey is a speech-language pathologist in Red Clay Consolidated School District where she works with elementary age students with autism and various special needs. She received both her Master's and Bachelor’s degree in Speech-Language Pathology at Towson University and is a certified aerial fitness instructor. Prior to going to college, Kelsey trained in ballet for 10 years at a pre-professional company in Newark, Delaware where she danced the leading roles in the Nutcracker, Alice in Wonderland, and Persephone. While completing her undergraduate degree, Kelsey took an aerial dance class where she trained on the low-flying trapeze, which inspired her to start aerial fitness classes. Kelsey has a special interest in teaching restorative, deep stretch aerial classes, classes for brand new beginners conquering their fears, and classes for children with special needs. From CEO to Aerial Aficionado - Read about Janice's Journey to become an aerial fitness instructor. She is certified in Level 1 / Level 2 / Level 3 Aerial Fitness, Aerial Thai Level 1, Aerial Bungee Fitness Level 1, AFAA Personal Trainer, Barefoot Training Specialist Levels 1 & 2, Health Coach, CPR / AED, and Speaker. Thank you so much for visiting my bio page. I’m so happy to meet you here! I am not what you would expect as an aerial fitness instructor. I’m not a gymnast, triathlon person or lifelong athlete. I’m not 20 something with the flexibility of someone whom you would think has no bones and joints in their body. I have spent 30 years in Corporate America mostly with Fortune 50 companies. There was no mountain too high and steep that didn’t capture my attention, excitement and perseverance. During those years I have run companies, product development, manufacturing and technology. As a leader my values always drove me to do what is in the best interest of the company and the people; treat everyone with fairness and respect, and value everyone’s contribution. A few years back I left when my husbands’ health started to decline. I “bumped into” aerial fitness at my ballroom dancing studio. I was instantly captivated. I was not a natural when I started , but in a few short years you wouldn’t have predicted how far I’ve come. My dream is to reach out to all of those folks who for whatever reason may not have been as active as they would want or need to be. I offer a supportive attitude, patience and fun in order to get started again. As little as 2 hours a week of some physical activity, does wonders for peoples’ physical, mental, emotional and psychological health. I would treasure the opportunity to meet and help each and every one of you . I hope you will come meet us and join me for a class; to see just how much fun it is. I offer early morning classes for the before work crowd; as many people are dead tired at the end of the day. Her flair for connection makes her a warm and welcoming face to have as a teacher. She will keep you safe and coming back for more. Certified in Level 1 and 2. Apprenticing Aerial Fitness Level 3. Karly received her B.S. in Marketing from the University of Delaware. As a driven, young professional, she has always seen the key to success as maintaining a healthy mind and body. Throughout college she was often seen running down Chapel Street. No matter the weather, nothing got in her way of achieving the “runner’s high.” However, it was clear that the continued stress on her knees would eventually require her to give up this fitness activity. Post graduation, Karly found herself hunched behind a computer, working full-time with elevated stress levels. Between her work schedule and daylight savings there was not much time to maintain a running regimen. Fully aware of how stress is detrimental to an individuals overall wellbeing, she tried yoga and meditation. But it wasn’t quite enough, in early 2013 she started attending Aerial Fitness classes. Aerial became ideal for de-stressing and forced her shoulders to relax. And in contrast to floor yoga, it didn’t cause joint pain! After a few classes, she noticed her tight hips gain range of motion. Furthermore, her flexibility increased and now she has more upper body strength then ever before! After gaining back control of stress, Karly knew as an instructor, she could one day encourage others. From Level 3 student to Level 1 teacher, Ann Marie has taken the journey full circle to share her love and skill in the hammock silks. Certified in Level 1 and 2, Aerial Thai Apprentice. Apprenticing Aerial Fitness Level 3 and Aerial Bungee Fitness Level 1. She is also training to become the student assistant teacher for our Intro to Lyra. Ann Marie has a Bachelor's degree in Chemistry from the University of Delaware. She works in chemical control law compliance during the week but most evenings and weekends she can be found "flipping out" at the studio. I was looking for a yoga class online and stumbled upon Aerial Fun and Fitness. I attended a class out of curiosity and I was hooked! One of the things that I like about aerial yoga is that it is an activity that pretty much anyone, regardless of age or fitness level, can enjoy and benefit from taking classes. I enjoy the spinal decompression and the increase in upper body strength that participating in aerial yoga has provided. I decided to teach because I want to share my experience with aerial yoga with others. I love seeing my students perform the flips and inversions, especially when they don't think they can do it. I love teaching my students and sharing in their sense of accomplishment! Level 1, 2, Apprentice Level 3 and Apprentice Aerial Thai. Gregarious, caring with a sense of humor, she takes her experience teaching equestrian and brings her skills here. Certified in Level 1 and 2, Aerial Thai Apprentice. Growing up Nicole enjoyed taking ballet and trained as an equestrian rider. After years of practice she starting teaching kids equestrian skills. Her main emphasis In high school was Early Childhood Education, preschool and Nanny experience. She is also TFEL certified to teach english as a second language and taught in Columbia teach english and help set up a campus ministry program. She came to an aerial class after researching it and loved the back stretch and opening she felt. She was hooked and finished her certification to teach Level 1 and Level 2. She is an all round teacher and has filled in for all the styles of classes. Currently performing with a local Exhibition Gymnastic Team. She is also a teacher assistant at Mt. Sophia Academy. Sarah comes from a back ground of nine years in gymnastics, the last five of which she has been performing on the exhibition team. Her experience includes tumbling, mini trampoline, hula hooping (standard, LED, and fire), and some acrobatics most recently the single silks. As a senior member of the team Sarah assists with creating routines and helping other team members learn new skills. She is looking forward to helping you learn new things too. Apprenticing in Aerial Fitness Level 1, 2, Bungee Fitness. Watch the fluid movement with hulu hoop. Apprenticing Aerial Fitness Level 1, 2 and Aerial Bungee Fitness Level 1.